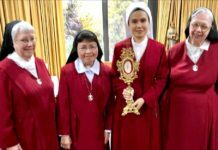 The Icon for WorldMeeting of Families 2018 was written at the Redemptoristine Convent in Dublin. 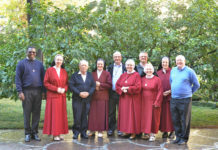 The cover story of the December edition of Reality charts the writing of the Icon for WorldMeeting of Families. The Icon was written at the Redemptoristine Convent in Dublin. We are very proud of the work of our very talented sisters. When the doors of this icon are opened we see in the centre the Holy Family of Jesus, Mary and Joseph seated at table, sharing a meal and sharing their faith. Their faith was celebrated in their home. It is in our home that the reality of God-with-us is communicated and passed on to future generations. Their gathering around the table is reminiscent of the Three Angels in the famous 15th century Icon of the Holy Trinity by Andrei Rublev. Christian Marriage is sometimes compared with the Holy Trinity, as a communion of the giving and receiving of love that is life-giving. Indeed, the family is called to be the “living icon” of the Most Holy Trinity. DOWNLOAD MORE INFORMATION ON THE ICON OF THE HOLY FAMILY HERE. Credit Photos: World Meeting of Families 2018 – WMOF2018 is the sole copyright owner of the “Icon of the Holy Family © World Meeting of Families 2018”. Dioceses, Parishes and Church organisations can reproduce the image of the icon up to an A4 size, for non-commercial purposes only. Permission for its use by other organisations, for commercial purposes or in any size largen than A4 is required.